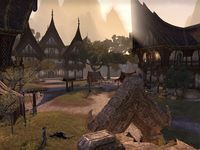 Dune's founding is unknown, though the style of architecture in Dune is reminiscent to some of Tamriel's most ancient history, when all of Elsweyr was ruled by an unknown Moon Emperor. In the early Second Era, the Second Empire had established Fort Sphinxmoth in Reaper's March, created to maintain peace in the area so that it would not interfere with trade in the north, around Skingrad. But as the Empire had fallen into disrepair, so did the Border Scouts that protected the land, and Dawnmead returned to its natural state. The Vinedusk tribe and the Dakarn clan waged war against each other in Reaper's March, taking refuge in the ruins of Sphinxmoth and ransacking merchant caravans. As time went on, both factions had subsided. The Vinedusk had staged a raid at Arenthia but overreached, and the Dakarn took to organized at Dune and Thizzrini Arena. Brigandry had ended in Reaper's March as people on both sides of the region formed militias and swept the hills clean of bandits. The Vinedusk reformed into the Vinedusk Rangers and the remaining Dakarn turned into the Duneguard Outwalkers. Reaper's March would return to peace. This page was last modified on 10 March 2019, at 23:42.